The endostaplers were safe and effective for lung resection. However, the endostaplers were not covered by national health insurance in Taiwan. The objective of this study was to evaluate the feasibility and safety of endoscopic suture for treating primary spontaneous pneumothorax. 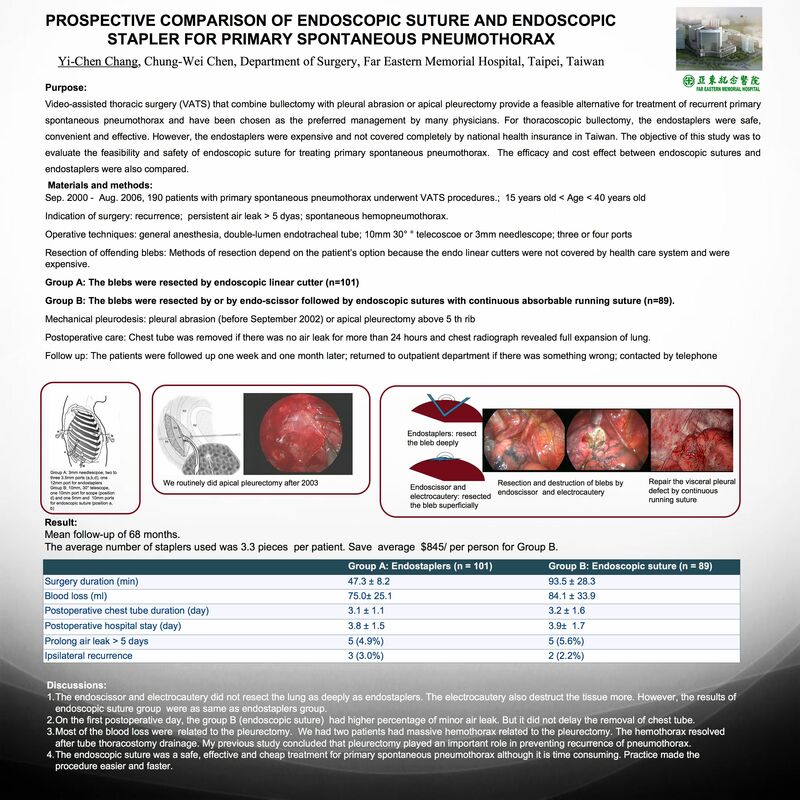 The efficacy and cost effect between endoscopic sutures and endostaplers were also compared. Between Sep. 2000 and Aug. 2006, 190 patients with primary spontaneous pneumothorax underwent video-assisted thoracic surgery (VATS) procedures. The procedures included resection of offending blebs and mechanical pleurodesis. The blebs were resected by endoscopic linear cutter (n=101) or by endo-scissor followed by endoscopic sutures (n=89). Methods of resection depend on the patient’s will because the endo linear cutters were not covered by health care system. Pleurodesis was achieved by pleural abrasion or apical pleurectomy. Chest tube was removed if there was no air leak for more than 24 hours and chest radiograph revealed full expansion of lung. The patients were followed up regularly at out patient department or contacted by telephone after discharge. Mean operation time was 47 min in the endostapler group and 93 minutes in the endoscopic suture group. The two groups had comparable blood loss, complication rates, post- operative chest tube and hospital stays. The average number of staplers used was 3.3 per patient, and cost $845. Ipsilateral recurrence occurred in 3 patients in the endostaplers group and 2 patients in the endoscopic sutures group after a mean follow-up of 38 months. The endoscopic suture was a safe, effective and cheap treatment for primary spontaneous pneumothorax although it is time consuming.